I *love* the way my first foray into creating resin pendants turned out. It’s finicky, messy, stinky material to work with (not to mention the toxic fumes it emits when you’re in the mixing stages), but it was definitely worth all the trouble to get these pendants just right. I started by pouring a crystal clear layer, then embedding the tiny photo reproduction of one of my original paintings into the resin. After letting it set, I added a bone-colored layer for the backing. To finish them off, I sanded and polished them by hand, then adhered a sterling silver bail to the back so they’ll hang nicely on any chain. 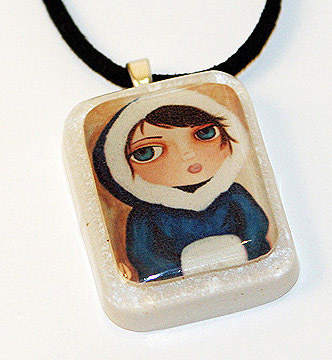 The winter girl pendant is available in the shop now. I have a few more with 3 other paintings to list in the shop next. All the “Bee Girl” ones are sold out already. Sorry! If you have any requests for specific paintings, I’d love your feedback for the next batch. I had such a blast making these that I’m sure there will be lots more to come! Keep checking the shop to see the new girls!